Die Laughing Productions is back with another hilarious whodunit Murder Mystery Comedy Show. From the people who brought you “Back to the 80’s,” comes “The Newly Dead Game.” You’re at a TV taping of the popular game show Clash of the Couples; a show where couples compete for cash and prizes. One couple will win it all and one contestant will lose more than the game, they’ll lose their life. 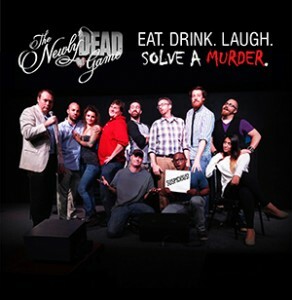 Fresh off his award-winning performance in “The Last Laugh,” 98 Rock morning show host Justin Schlegel is back as the star of “The Newly Dead Game. Joining him again will be comedians Rob Maher, Joe Robinson and Tommy Sinbazo; also 98 Rock regulars. However, the real stars of the show are once again, you the audience. Some of you will get to play parts in the show and all of you will guess who the murderer is. Guess right and you could win something new and shiny. Guess wrong and you’ll live with the shame and despair forever.